Restore Inner West Line supports new train services for the Western Sydney Airport. We believe that restoring the Inner West Line to Liverpool is an important first step to improving public transport for Western Sydney. Following reinstatement of Liverpool via Regents Park train services, we believe that the Inner West Line should be extended to Campbelltown using existing South Line tracks. Current Campbelltown via Granville train services should be re-routed to the Leppington. 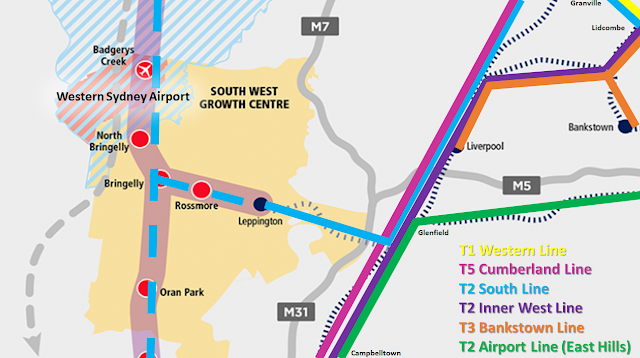 The South West Rail Link should be extended from Leppington to Badgerys Creek for the Western Sydney Airport followed by a north-south rail line to St Marys and Narrellan.